Two days ago, my Amazon Kindle Fire arrived in the mail. I had a pretty exciting time with the Kindle Fire, and I will give you a hands-on review of that if you leave enough comments demanding one. Fortunately, I was prepared for the Kindle Fire with the Verve Folio Stand by Belkin. It definitely gives my Kindle Fire some protection, and since it is a leather portfolio, it makes the newest e-book reader/tablet feel like an old book. Of course, an old book can’t prop itself up so I can read like a display at many angles. An old book can’t show all the video that the Kindle Fire can show. All right, this is beginning to sound like a review of the Amazon Kindle Fire, but this is about the Verve Folio Stand. I like that the Verve Folio Stand has an elastic strap that can keep it shut. This makes me feel better about carrying the Kindle Fire around in a bag, and protect it from scuff marks. I recommend the Verve Folio Stand if you got yourself a Kindle Fire. By the way, I have noticed that the Kindle Fire is about the same size and shape as a BlackBerry Playbook. This means that if you are just needing protection for your Kindle Fire, BlackBerry Playbook protectors like that one I reviewed from Ballistic the other day, will work, as long as you don’t mind not being able to access the Kindle Fire’s headphone jack and other ports. 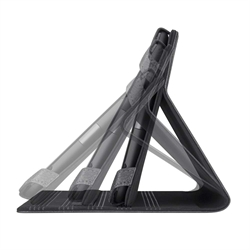 If you want more information about the Belkin Verve Folio Stand, feel free to head to the Belkin site here. I found a product with the same name on Best Buy for about $39.99, so I am going to assume that is the usual price for this item.